In December 1900, a boat called Hesperus set sail for the island of Eilean Mor, one of the seven islets (also known as the “Seven Hunters”) of the Flannan Isles off the coast of northwestern Scotland. 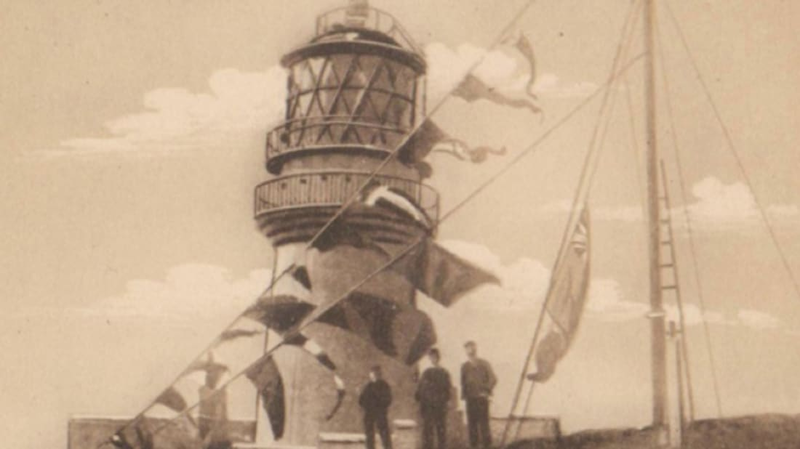 Captain James Harvey was tasked with delivering a relief lighthouse keeper as part of a regular rotation. The journey was delayed a few days by bad weather, and when Harvey and his crew finally arrived, it was clear that something was awry. None of the normal preparations at the landing dock had been made, the flagstaff was bare, and none of the keepers came to greet the Hesperus. The keepers, as it turned out, weren’t on the island at all. All three of them had vanished. Eilean Mor had its peculiarities. The island’s only permanent residents were sheep, and herders referred to it as “the other country,” believing it to be a place touched by something paranormal. Eilean Mor had long elicited a sort of fearful reverence in its visitors; the main draw to the remote location was a chapel built in the 7th century by St. Flannan. Even those who never prayed were moved to worship while on Eilean Mor. Superstitions and rituals—like circling the church’s ruins on your knees—were adopted by those passing through, and many considered Eilean Mor to have an indefinable aura that could not be ignored. What the Hesperus crew did find at the lighthouse was a set of perplexing clues. The replacement keeper, Joseph Moore, was the first to investigate, and reported an all-encompassing sense of dread as he ascended the cliff toward the newly constructed lighthouse. Inside, the kitchen table contained plates of meat, potatoes, and pickles. The clock was stopped, and there was an overturned chair nearby. The lamp was ready for lighting, and two of the three oilskin coats belonging to Thomas Marshall, James Ducat, and Donald McArthur were gone. The gate and door were firmly shut. A dreadful accident has happened at Flannans. The three Keepers, Ducat, Marshall and the occasional have disappeared from the island. On our arrival there this afternoon no sign of life was to be seen on the Island. Fired a rocket but, as no response was made, managed to land Moore, who went up to the Station but found no Keepers there. The clocks were stopped and other signs indicated that the accident must have happened about a week ago. Poor fellows they must been blown over the cliffs or drowned trying to secure a crane or something like that. Night coming on, we could not wait to make something as to their fate. I have left Moore, MacDonald, Buoymaster and two Seamen on the island to keep the light burning until you make other arrangements. Will not return to Oban until I hear from you. I have repeated this wire to Muirhead in case you are not at home. I will remain at the telegraph office tonight until it closes, if you wish to wire me. Speculation ran wild. Was it something supernatural? Sea creatures? A case of madness and murder? A government operation? Foreign spies? Aliens? Ultimately, it was evidence outside the lighthouse that provided the most promising lead in explaining what had become of the three keepers. Over at the western landing platform, damage from the recent storms reached as high as 200 feet above sea level. Ropes that were usually affixed to a crate on a supply crane were littered about. I am of the opinion that the most likely explanation of this disappearance of the men is that they had all gone down on the afternoon of Saturday, 15 December to the proximity of the West landing, to secure the box with the mooring ropes, etc and that an unexpectedly large roller had come up on the island, and a large body of water going up higher than where they were and coming down upon them had swept them away with resistless force. While this (or a similar approximation) seems possible, the explanation left considerable room for doubt. 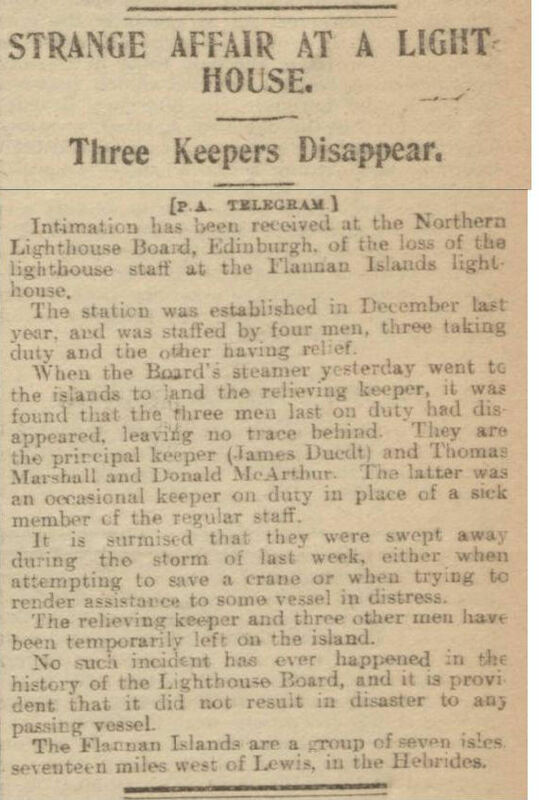 The lack of bodies, supposedly calm conditions, and sheer experience and know-how of the lighthouse keepers still hadn’t been accounted for, and never would be. In the years following, other keepers claimed to hear voices in the salty air screaming out the names of Thomas Marshall, James Ducat, and Donald McArthur.